Crooked Teeth in Valrico? Try Invisalign! Now is a great time to have crooked teeth! Why? They can easily be straightened. There are few technological wonders of our era that are more appreciated than modern braces. Teeth straightening hardware of past generations in Valrico had many drawbacks. They often involved a whole orthodontic tool kit–full metal bands, headgear, elastics, spacers, and wires poking every which way. If you played an instrument that required the use of your mouth, well, it wasn’t pretty. 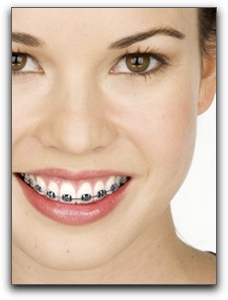 Metal braces for most in Valrico were uncomfortable, bulky, and downright ugly. They also created many hidden nooks and crannies for bacteria to quietly drill into your enamel. If you are too young to remember old school braces, you can’t truly appreciate the ceramic braces, clear braces and Invisalign aligners available today right here in Brandon FL, Riverview FL , and Valrico. Even traditional metal braces are now smaller, less noticeable, and more comfortable. The advancements in Valrico orthodontic treatments and shorter treatment times is one reason many Valrico adults have chosen to straighten their teeth even if they passed as a teenager. Does that mean you don’t need to have your child seen by a Valrico orthodontist if you suspect problems? Absolutely not. The American Association of Orthodontics recommends early Valrico orthodontic evaluation. It is always best to identify problems with teeth and jaw development early. Your orthodontist or pediatric dentist will know the proper age to begin treatment if necessary. We provide many cosmetic dental services at Five Star Dental Care in . Did you know that Valrico porcelain veneers can solve some less-extreme tooth alignment problems? If your teeth are fairly straight but your smile is compromised by a couple of damaged or chipped teeth, affordable porcelain veneers may be your one-visit solution. For more information about the Brandon FL cosmetic dental options offered at Five Star Dental Care in , see /about-us/ or call 813-653-2273. This entry was posted on Friday, July 12th, 2013 at 10:47 am	and is filed under Invisalign. You can follow any responses to this entry through the RSS 2.0 feed. Both comments and pings are currently closed.